Join the discussion on our forums! Come discuss The Forest's Aid over in our dedicated The Forest's Aid discussion topic. Meta-review: This card is the reason why Token Druid is the best performing deck in Hearthstone currently. It gives you sustain against late-game decks. Either they clear the board multiple times or you Savage Roar them down from 30. I thought this card would be WAY too slow, but after playing it in a full-on Token Druid, it's actually great in the context of the whole deck. What I didn't realize when I first saw this card, was that by the time you get to 8 mana, your opponent has likely already used board clears or a bunch of removal dealing with your earlier token boards. You've also probably done some significant damage to their face and have some board buff cards still sitting in your hand. Playing this card is asking your opponent "do you have a board clear for this turn AND a board clear for next turn, or are you going to die to Savage Roar?" It's also one of the few cards that gives you a chance in a Control Warrior meta with Warpath and Brawl everywhere. Warpath wrecks Soul of the Forest, but being able to reload with this is great. Exactly!! This card is nuts. Plus its only rare! 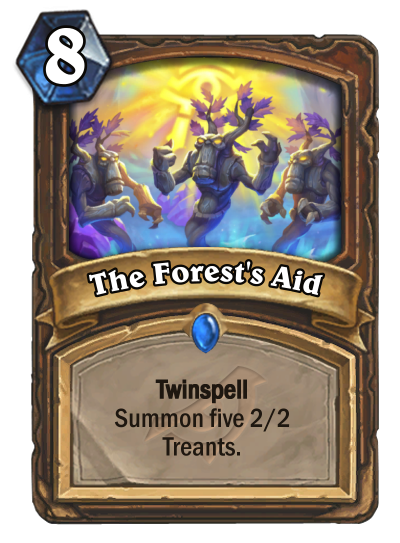 So only a few hours into expansion but Im actually thinking this card is pretty solid in a tokeny style druid. I mean ideally you want to play this into a weak board and force your opponent to have an answer 2 turns in a row or risk being buffed. Cards like treespeaker make it interesting as well. I guess it will depend if cards like Wild Pyromancer are common. I mean, I can see the value, but I think there's a problem with how slow and lacking in impact on its initial turn it is. 8 mana for something that can be cleared with any spell power minion with a 1 damage AOE, or a Blizzard, or something else. While not the best comparison, Force of Nature's change to being a slightly smaller version of this, albeit without the double up on casting it, and how it plummeted in how often it was played might prove that something this slow and lacking in momentum is bad, especially in Standard Druid now when most restricted in removal to help get back tempo.